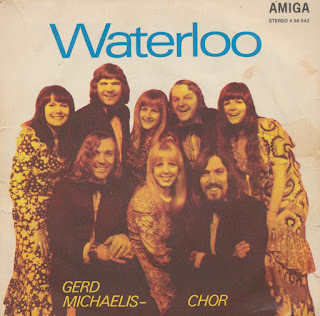 Abba's legendary Eurovision song 'Waterloo' has been covered by various bands such as Bananarama and Doctor & the Medics, but this single features a cover by a East German choir - and that's a different kettle of fish. Released on the state-owned Amiga label, the Gerd Michaelis-chor was famous for their performances of Schlagers, but they also recorded cover versions that were popular in 'Western Europe'. This was the time of the iron curtain, when people in Eastern Germany were not supposed to listen to just any old thing, after all.